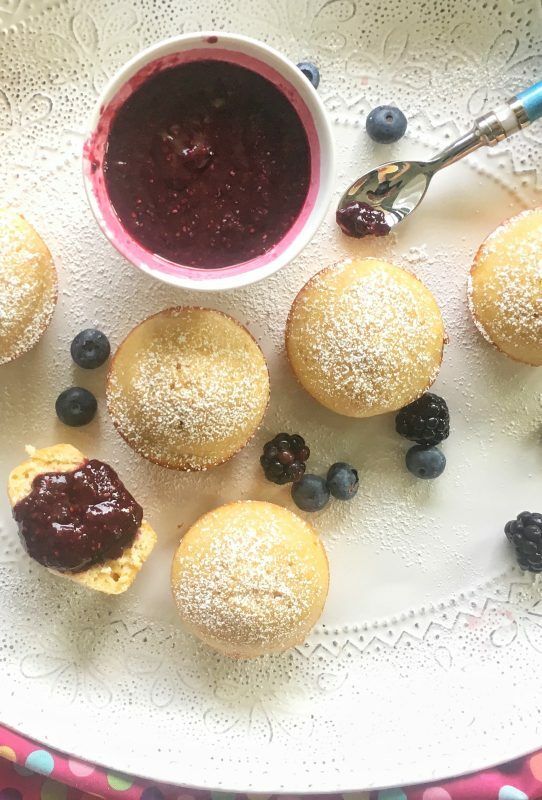 This slightly-sweet recipe for mini Lemon Olive Oil Cakes with Mixed Berry Sauce sounds like a decadent dessert, but it’s made with extra virgin olive oil versus butter and a moderate amount of sugar, so the saturated fat and added sugar isn’t too ridiculous! 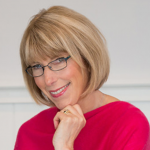 I started blogging 10 years ago at Meal Makeover Moms’ Kitchen. That site was recently retired, and Liz’s Healthy Table was born. 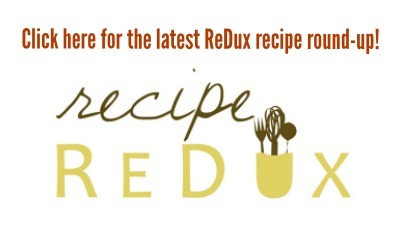 For the past six years, I’ve been part of a monthly food blogger cooking group called, The Recipe Redux. Well today, participating bloggers are celebrating their 6th birthday with cake or another small bite dessert. 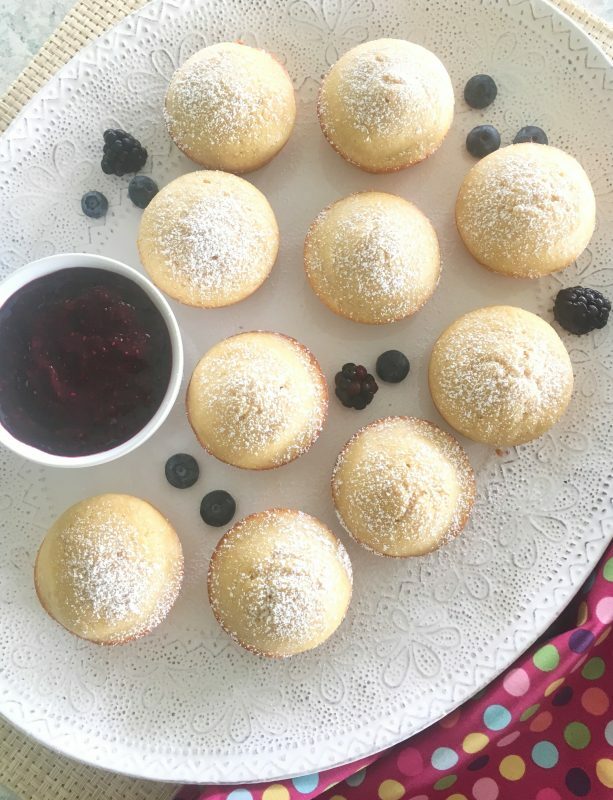 For my part, I decided to make these little lemon cakes, baked up simply in muffin tins. I don’t tend to use a lot of butter in my cooking, because it’s high in unhealthy saturated fat. So I often experiment with plant-based oils like extra virgin olive oil and organic canola oil. The rule of thumb when it comes to substituting a solid fat like butter with a liquid fat like olive oil is 1 cup solid fat to 3/4 cup liquid fat. I’ll admit that I’m not an expert in baking science, which is why I really just play around until I get it right. The recipe calls for just half a cup of sugar, extra virgin olive oil instead of butter, and a mixed berry sauce thickened with chia seeds. It’s slightly sweet, has a lovely lemony flavor, and can do double duty as a dessert or a snack. If you don’t have chia seeds, use a teaspoon or two of cornstarch to thicken the sauce. When I cook and bake, I gravitate to oils like EVOO. Plant-based oils are low in saturated fat and they're rich in healthy monounsaturated fats. Even though extra virgin olive oil tends to have a stronger flavor than say organic canola oil, it doesn't come through on these cakes. What you taste in every bite is the lemon zest and lemon juice. The cakes are slightly sweet with a nice lemony zing. And the berry sauce on top adds another lovey layer of fruity flavor. Whisk together the two flours, baking powder, and salt in a large bowl. Spoon the batter into the prepared muffin cups. Bake about 18 minutes, or until the cakes are light golden and a toothpick inserted in the center comes out clean. 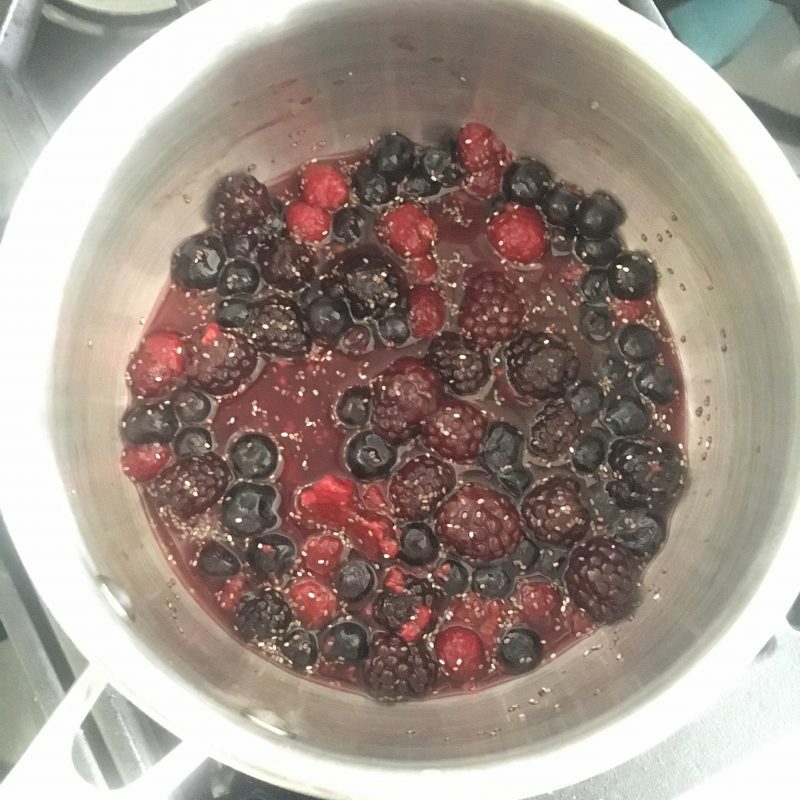 While the cakes are baking, make the sauce by placing the frozen berries, water, lemon juice, sugar, and chia seeds in a small saucepan and stir to combine. Place over medium-high heat and bring to a boil. Reduce the heat and simmer, stirring frequently, 10 minutes. Remove from the heat and cool about 10 minutes. Transfer to a small food processor or blender and pulse several times until pureed. Transfer to a bowl and serve warm or at room temperature with the cakes. 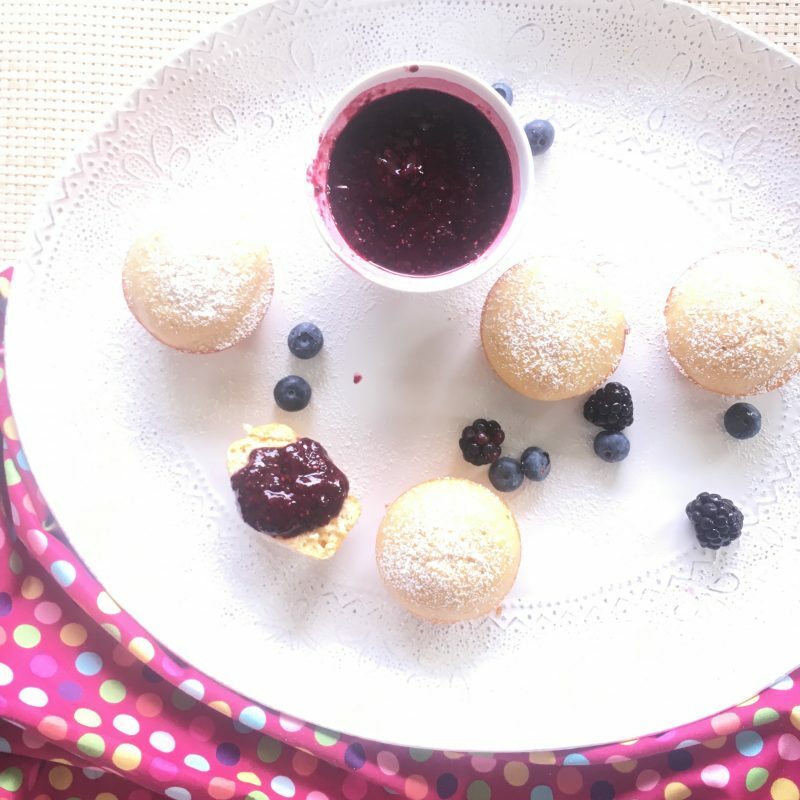 Click below for more mini dessert inspiration from other Recipe Redux members. These look so yummy! I haven’t done much sweet baking with olive oil-I would love to try a gluten-free version of these mini cakes. I make berry lemon sauce all the time-so easy, healthy, and delicious! I hope your summer is off to a fabulous start Liz! EA, if you make them GF, share the recipe. I do want to start baking more with almond flour. Just need to master that ingredient! Love this recipe Liz! I l need to experiment more with baking with olive oil. I’ve tried it at bakeries and restaurants and love it, so need to try at home. Let me know if you end up making it!! You won’t even taste the olive oil. The lemon zest and juice are the flavors that shine through. These look and sound delicious! Perfect for summer! They sure are. thanks for stopping by!! Love that your berry sauce has chia seeds in it! !